BIG beardies photos, please! • Bearded Dragon . org . Re: BIG beardies photos, please! Hippielizard your babies are amazing. I love that the pics show their individual personalities! I love looking at everyone’s pics. It’s amazing how happy and how much their personalities show. And some may be big and some may be small but I am learning no matter the size they all have HUGE personalities and are not afraid to show it! I agree Dezismom. I am glad I didn’t know the care and expense cause then I would be missing out on a great friend. But at the same time not all owners of any animal no matter what kind of animal are willing to care for them and put in any effort. HippieLizards, your crew are wonderful! 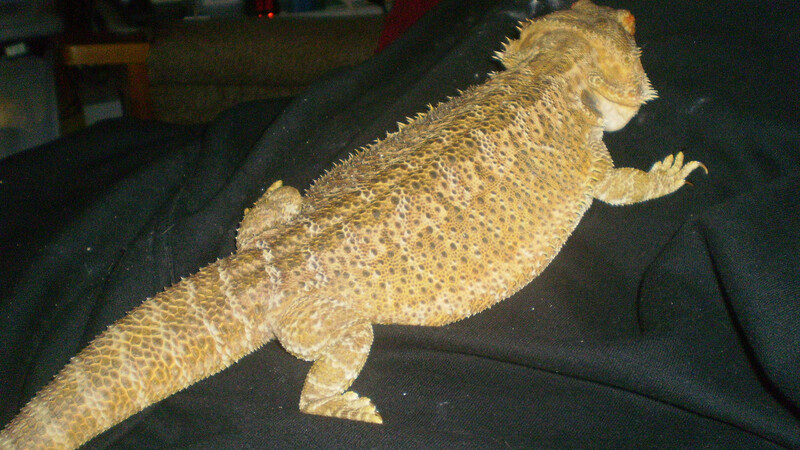 At 19 1/2", Loki is truly a big beardie! and how funnny that he reacted with such vigor to just a photo of DeziLu....and Cisco is a lovely color. Being grumpy just makes her more adorable. Diva Daisy (cute name) is especially stunning in her bunny costume! Is that a home made costume? I have dressed Dezi--he will tolerate it, but is not happy about it. His frowney face is so funny, like he is eating lemons. He is quite emotional, and not one to hide his displeasure. I was brushing him with his favorite soft brush one day during the presidential elections madness, and on a whim, I placed the brush on his head and called him President Dezi Trump. His frown of displeasure made it even more funny. He definitely did not approve, ha, ha! Perhaps, he is not of the same political party? here is Dezi dressed as President Trump. (no political statement implied, no offense against wigs was meant...we were just having some fun. one of her fav places …. her way of taking over my fav lounge seat …. when I'm not sitting there. I'm loving these pictures. So many big happy beardies. Super cute! Peppa is so fabulous, and huge! I imagine if she and my big boy Dezi ever mated, what magnificent babies they would produce! They are both so red and big, it would be like a whole new line of giant beardies! Lorilyn wrote: Hippielizard your babies are amazing. I love that the pics show their individual personalities! I love looking at everyone’s pics. It’s amazing how happy and how much their personalities show. And some may be big and some may be small but I am learning no matter the size they all have HUGE personalities and are not afraid to show it! Lol Thank you, They do have very big personalities and all act different in their own unique way. and They are definitely very smart because one day I came back home from Repticon and I had bought some insects (some BSFL, Butterworms as a treat, and some Supers and Daisy's favourite, Hornworms). I Got the Hornworms out on my bed and tried offering one to Thor who ate a few, and while having Daisy out on my bed I realised she was eyeing the open cup of Hornworms, So I closed the lid. and While giving a few Supers to Cisco Daisy had figured out that if she shoved her snout into the side of the cup, pushed up and tried digging at it, she popped the lid open, and ate 20 out of the 25 Hornworms I had bought. So they are little geniuses. dezismom wrote: HippieLizards, your crew are wonderful! 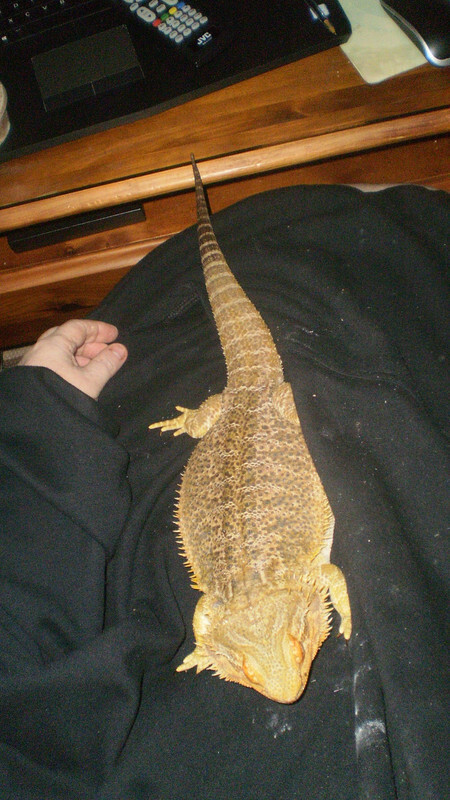 At 19 1/2", Loki is truly a big beardie! and how funny that he reacted with such vigor to just a photo of DeziLu....and Cisco is a lovely color. Being grumpy just makes her more adorable. Diva Daisy (cute name) is especially stunning in her bunny costume! Is that a home made costume? I have dressed Dezi--he will tolerate it, but is not happy about it. His frowney face is so funny, like he is eating lemons. He is quite emotional, and not one to hide his displeasure. I was brushing him with his favorite soft brush one day during the presidential elections madness, and on a whim, I placed the brush on his head and called him President Dezi Trump. His frown of displeasure made it even more funny. He definitely did not approve, ha, ha! Perhaps, he is not of the same political party? Lol Thank you. Loki has always been a bit of a 'big boss man'. He always tries to impress the ladies, Even if it isn't the same species. He was out basking in the sliding glass doors and our cat comes up to the glass and starts meowing. So Loki starts head bobbing, black bearding and trying his best to impress her. and Of course she if terrified and runs off while Loki is frantically trying to get through the windows. He Also for some reason sees my shoes as a threat so he'll try to either, poop on them, bite them, scratch them, lick them, or mate with them to show my poor shoes he's the boss. and Yes, I Love Cisco's colors and I've never seen one as pretty as her. Also president Dezi Looks good lol But I Do agree, If you were to pair up Dezi and Peppa we might get some beardies around 3+ feet long! Lol yep, That was Loki Majestically basking in the windsheild of our car while driving to repticon. He was loving the 80 something degree weather outside. and You're lucky for Miss Biggs to come when her name is called. Cisco will come occasionally if I call her name and I have a superworm in one hand but most of the time they just stink eye me and are like "What? If you want something to come to you when you call it then get a dog". I have had dragons who came when called , and all my pet skinks do this , even some of the wild ones I've befriended and give wormy treats too. Peppa comes to me when I call her if she is on the floor. Rex and Puff did too. Toothless always had his own agenda and only came if it suited him. They know what's going on and learn a lot more than most give them credit for …. it all comes down to how they are nurtured when young . I often think they are training the keeper rather than the other way around. I am certainly being trained. LOL I just ordered silk worms and the shipping cost more than the worms. If anyone else asked me to do that I would laugh at them. My son says he is second now to a lizard and he thinks it’s funnier cause I didn’t want it in the first place and I was more afraid of her than she was of me. My hubby says he is sometimes second to the lizard, too! But he loves Dezi, so it is okay...Yes, the live food cost is sometimes pretty amazing, especiially when they are growing and want their bugs! Dezi cost us over $100 a month when he was at his fastest grow rate. He needed three big meals a day, plus snacks! Now, he eats some veggies, thank goodness. 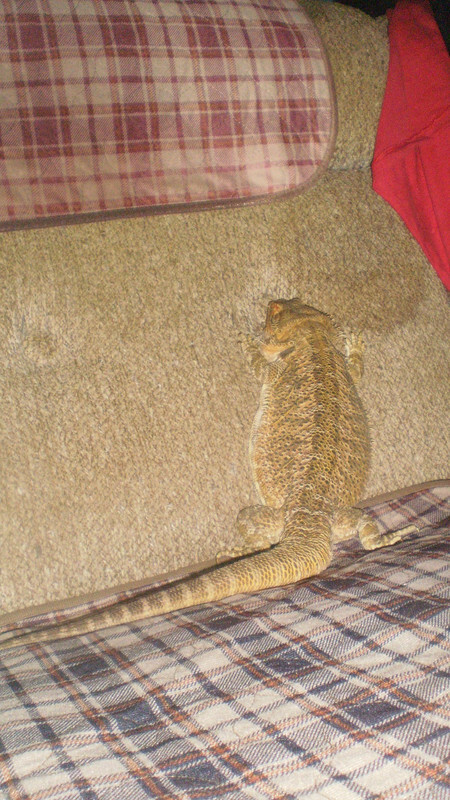 dezismom wrote: My hubby says he is sometimes second to the lizard, too! But he loves Dezi, so it is okay...Yes, the live food cost is sometimes pretty amazing, especiially when they are growing and want their bugs! Dezi cost us over $100 a month when he was at his fastest grow rate. He needed three big meals a day, plus snacks! Now, he eats some veggies, thank goodness. My husband calls her his pretty big girls. When he comes home he always greats her and scratches her beard or holds her hand. It’s funny cause At first he said ABSOLUTELY no bugs in the house especially roaches. He was the one who bought her the first roaches and when I told him we could get them cheaper on line in bulk he said do it. LOL I wish she was eating like she was a month ago but my bank account is happy. She loves her collard greens and zucchini and carrots. Maybe too much cause she will turn her nose up at bugs but turn around and gobble up her salad. Maybe she stopped growing as fast as she was. That’s cool kingofnobbys that they do come when called. I honestly thought it was more of a coincidence. But I do know she likes my iPad especially when I play a puzzle game. She doesn’t like any of the bug games. Dezi very suddenly started eating salad, too...it was no way, for three years, then oh, yeah all of a sudden. Now, he gets a bit miffed if I do not offer some fresh greens from the little garden we started just for him! We are growing lettuce and veggies just outside the kithchen door, so I can pick his greens fresh daily. He eats better than we do! 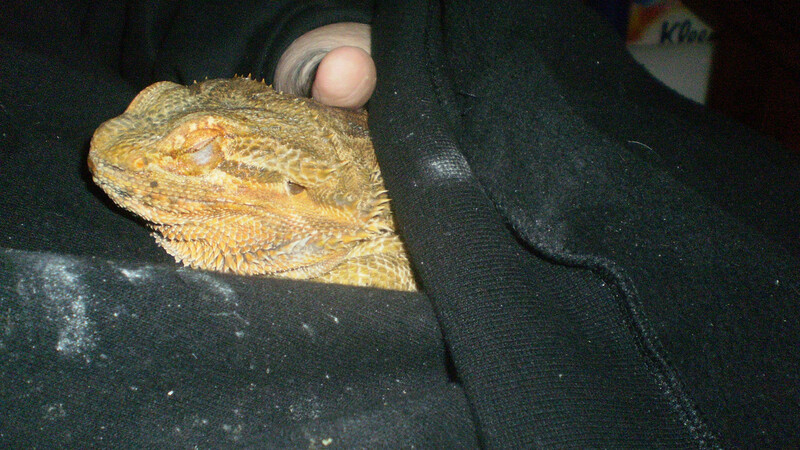 under chin fat is a part of a BIG Beardie! and Daisy being Lazy and showing off her droopy beard Lol. But I am very jealous that Y'alls beardies are eating only greens.. Mine will only eat bugs and accept greens like once a week. Thankfully today they finally ate some greens but that was after having a insect feast. I wanna snuggle with all those Gorgous beards. And no garden here. I am a plant killer so it’s added to the grocery list for me.